This is our bed. I love it! 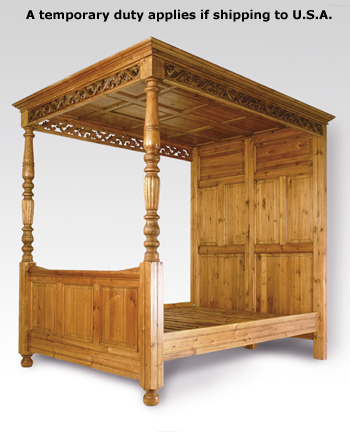 I had bought this bed many years ago from a company in Vancouver, BC. It’s hand carved and majestically sits in our bedroom like a room unto itself. Or, more accurately, like a railroad carriage. I do a great deal of my writing in the wee hours of the morning, sitting in bed propped up by a bounty of pillows and surrounded by six wee pups (who are fascinated by the laptop keyboard and all the tap tap tapping away I do on it). Looks a bit messy because I jumped out it to snap a quick photo with my iPhone. When I’m writing I turn off all the lights and do my writing by the glow of the computer screen (how romantic is that!). And in my mind I imagine myself sitting alone in a darkened railroad compartment that I used to ride in when I first traveled through Europe, England, and Scotland. There is something very reassuring about sitting in a railroad compartment on a long train ride through darkened landscapes. You can’t see anything out the windows so your only options are: sleep, read, or write. I generally chose to write. There was something about the gentle rocking, and occasional lurching, of the train that was conducive to writing stories. 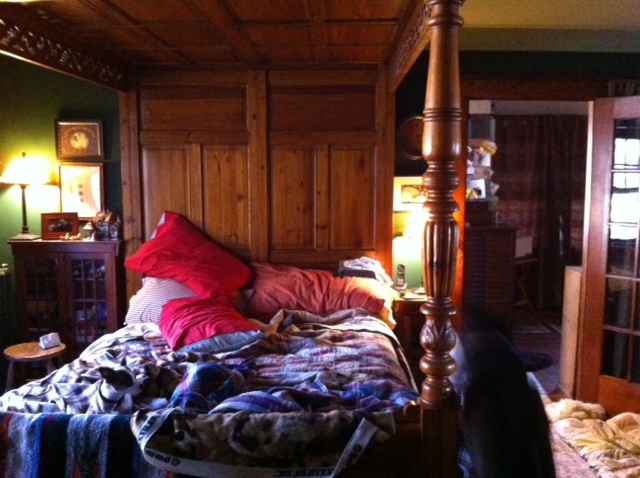 Our bed is about the same size as a first class old-fashioned railroad compartment and the perfect place to write. I have fantasized about rigging up some sort of contraption to gently rock the bed to simulate the rocking motion of the train and the synoptic sound of the click, click, click as the wheels of the train clattered on the rails. 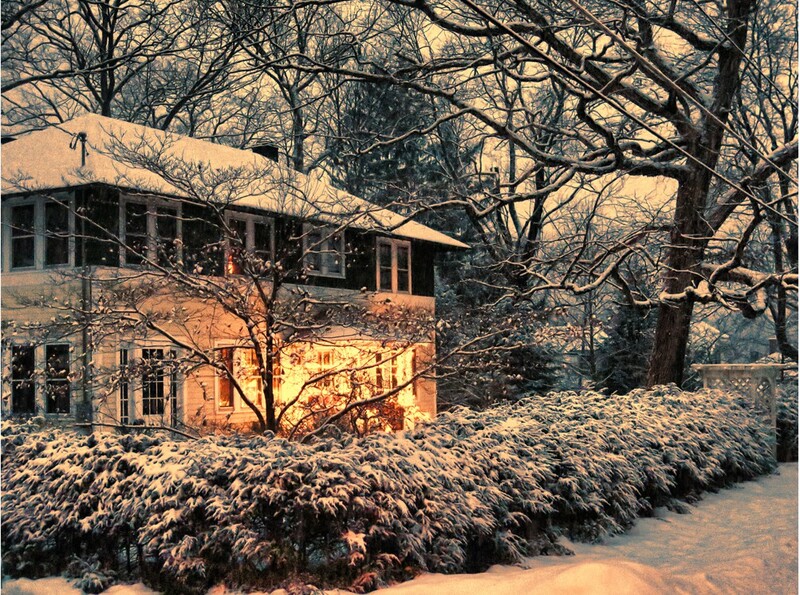 Just thought you might like to know what kind of surroundings I like to be in when I write. 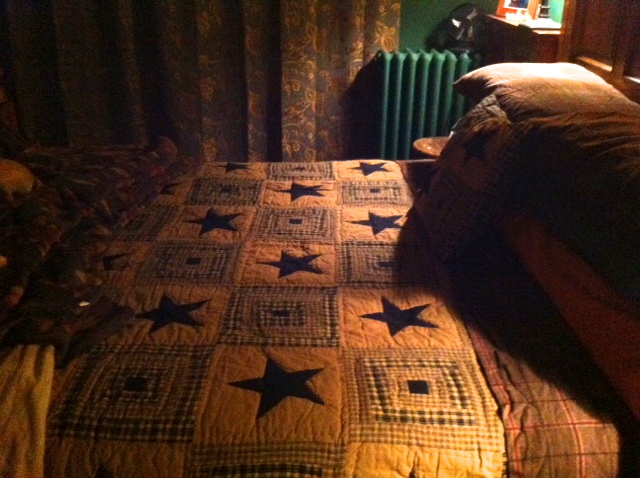 Oh, and here’s the bed nicely made. STUDIO UPDATE: Before I can ever settle down to getting serious work done in the studio I always have to fidget, rearrange, find something that I absolutely must find, and draw a map. Just to organza my thoughts. And I have to look up favorite quotes to urge myself on. Of course, ALL my favorite quotes are kept in my trusty, most beloved, Filofax. Filofax. How many of you remember these when they first came out? ALL the intellectuals, on-the-go professionals had one (or some variation of it). Mine is about 35 years old. I bought when I first got published. At Bloomingdale’s! (of course). It cost a small fortune. It’s Italian. And I carried it everywhere with me in my leather shoulder bag (naturally). The Filofax is where you kept all your addresses (personal and professional); wrote your notes, carried your specially made Filofax maps of the cities that you absolutely had to find your way around, receipts, entered expenses (business and massage parlor), etc. No one would be caught dead without their Filofax. AND…I only bought my Filofax replacement pages/address pages, etc. in London! I WAS a writer-on-the go, after all. 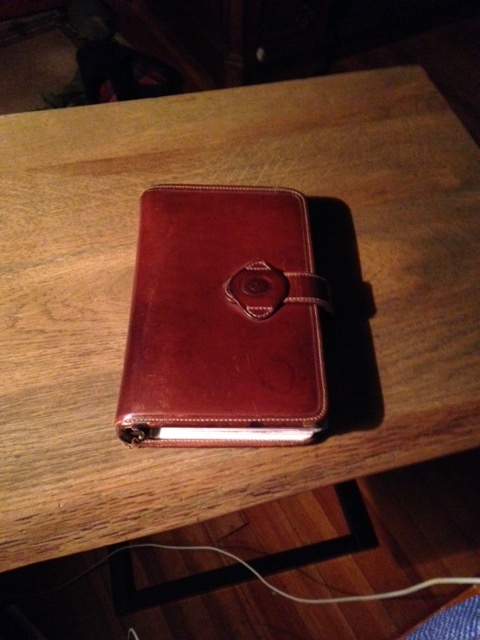 The Filofax was replaced by the Palm Pilot, then Blackberry, then Smart Phones (iPhones). Everything that I now keep on my iPhone I used to keep in my Filofax. But, I still carry my Filofax in my shoulder bag everywhere I go. I just cannot imagine abandoning it. It was my best friend, Wayne Wright, who had insisted that IF I really wanted to be a writer I had to, ABSOLUTELY had to, read (and understand) Gertrude Stein. When Wayne was dying from cancer I used to travel from Philadelphia to Boston to be with him. He slept a great deal when he was on chemo and was too tired to talk. So, to keep myself busy I began reading Gertrude Stein. All of is Gertrude Stein books. 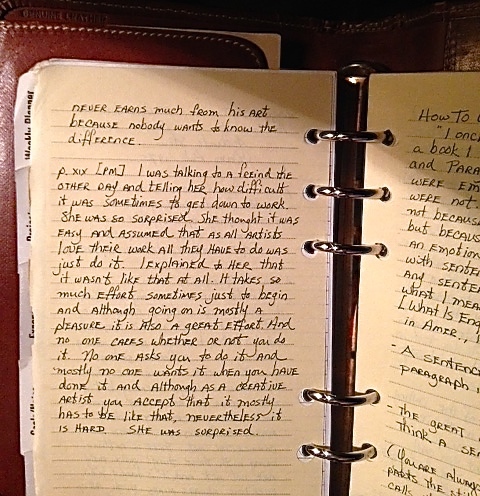 And her writing did change my life and perspective as to how I perceived myself as a writer. So, tonight I just HAD to find this quote (see photo). It’s reassuring to me somehow. And now I can get down to work. I recently discovered that a new friend is a terrific writer! And he didn’t know it! I told him that he must, must, MUST read two books (that every writer should read): The Autobiography of Alice B. Toklas by Gertrude Stein and The Autobiography of Janet Frame (and then watch the film ‘An Angel at My Table’ that is based on her autobiography. So now that I have read the quote I needed to find I can concentrate on settling down to work in the studio. Some people have to sharpen all their pencils before they can begin to work in earnest. I have to read favorite passages/quotations. I’m one of those odd ducks (or should I say goslings) that cannot function if the house, especially the studio, is a mess! Spring cleaning has begun in earnest now that I am back at Henwoodie. Cluttered Studio = Cluttered Mind and no productivity. 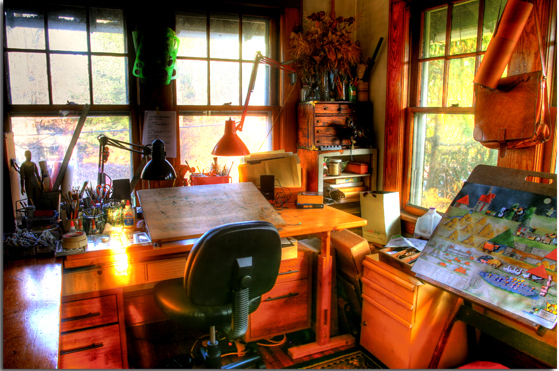 Uncluttered Studio = Uncluttered Mind and lots of productivity! While I was in Dearborn John and I had gone shopping one day and bought a number of sturdy storage boxes. I have to keep all my electronic cords and gadgets in one place and off the work tables in the studio. Larger storage boxes will hold sketches and notes while I’m working on books. Again, I like to keep things that I’m working on all in one place. I had also brought quite a few new paintbrushes. Gouache tends to be hard on watercolour brushes. I buy inexpensive brushes that I don’t have to worry about ruining. Whereas with watercolour I only use Winsor & Newton Series 7 sable brushes which can get quite expensive. The pups are figuring out their spots to lay down while I sit at the drawing board for hours on end. A small space heater is their personal heat source to keep them comfortable (the studio is unheated) and cozy. Of course, they have a plethora of fleecy blankets to curl up in as well. And treats. And toys. It’s like having pup daycare in the studio so that I can work done. Many years ago my best friend, Wayne Wright, who was one of the best writers I know, urged me to “listen in” on other peoples’ conversation in order to hone my skills as a writer whenever I had to write dialogue. Authentic dialogue, the way people actually spoke, not the way I imagined someone would say something. He emphasized that this was especially true when travelling abroad. I just came across an old writing notebook with lots of scribbled “dialogue”. 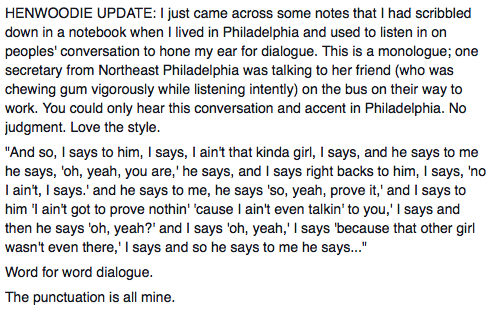 I must admit that NOT being FROM Philadelphia I had never heard this particular kind of speech pattern before. I became totally caught up in the rhythm and pace of the monologue. I don’t think I’ve ever scribbled in my notebook so fast because the speaker talked a blue streak! I can’t remember if I posted this before: In regard to how I work as a writer (not writer/illustrator)—I might spend nights, days, weeks, even months thinking about the writing I want to do. I will often lay in bed (just before falling asleep) and will ‘write’ scenes or entire stories in my head. I either imagine the story in words or I can actually see it frame by frame as movie stills. Sounds weird, I know. Night after night I will start from the beginning and think a story as far as I can go. Often adding new details, new insights, new twists. I don’t worry about whether the ‘writing’ in my head is logical or not. I simply tell myself the kind of story I’d love to read…or live! 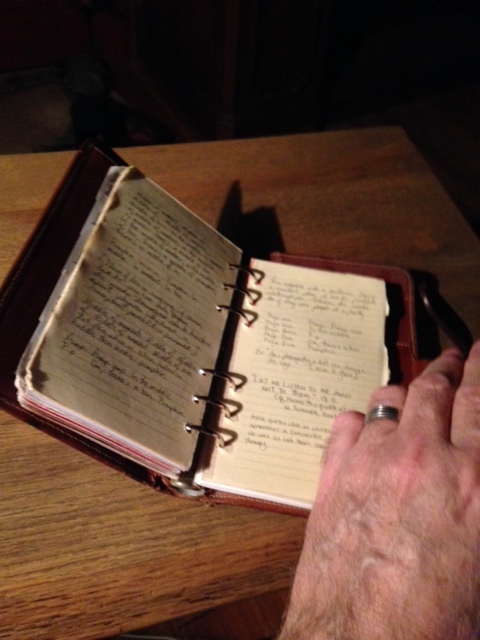 And once I’ve thought about the story long enough I just know when the right time has come to sit down and do the mechanics of “writing” the story—either with a pen and notebook or on my laptop. On my laptop, after all the thinking about the writing is done (in my head) I can tap out 10, 15, 20, or more pages in a couple hours. I’m a fast, accurate typist. I don’t worry about the technical aspects of the writing at this point: punctuation, grammar, spelling, etc. I just write. And I try NOT to think about the writing. That is the great advantage in knowing HOW to type. Typing is the most important aspect of the mechanics of writing. I don’t watch my fingers, I never take my eyes off my laptop screen as I watch the words appear and just let them come. Not having to think about the mechanics of typing frees my mind up to concentrate on the writing, the storytelling. It is so painful for me to watch someone struggling with one or two fingers on a keyboard and trying to write at the same time. HOW can they even think about words when they are so preoccupied with finding the letters on the keyboard. My advice: Take two weeks and learn touch typing. At the end of two weeks you should be able to type at least 35 wpm. It’s like driving a car. NO ONE in their right mind would just get into a car and assume they can drive without learning the mechanics of driving. If you want to write, learn the mechanics of writing. STUDIO UPDATE: Writing is easy. Honest. It really is. It’s the thinking about the writing, coming up with a compelling, provocative, original story line, plot twists, planting clues, not leaving important things out, not putting too much in that is a bit more challenging and difficult (at times). And it is the unthinking the writing when you have to edit, rewrite, revise, edit a bit more, tweak a bit more, go back and rethink the writing that was already thought. Trust me, writing is easy. It’s all the other steps that can be a bit nerve-racking. As a writer and illustrator I tend to work in near complete isolation and solitude (like most writers). One day merges into the next without any real separation in time and space. One of the nice things about writing is that you never know what might be delivered to your doorstep. This afternoon two unexpected, unlooked for boxes arrived from my publisher! 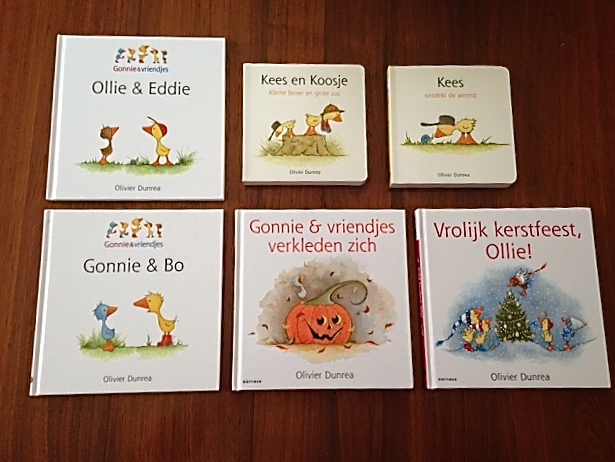 Six new Dutch editions of existing books as well as Gemma & Gus and Gus! Both the U.S. and Dutch editions were officially published on 3 March. You will notice the changes to the front covers that my Dutch publisher, Gottmer, made to the books. 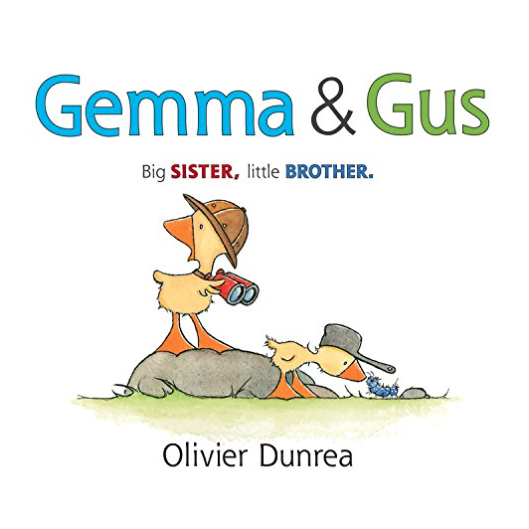 And they put Gus’s name first for Gemma & Gus. 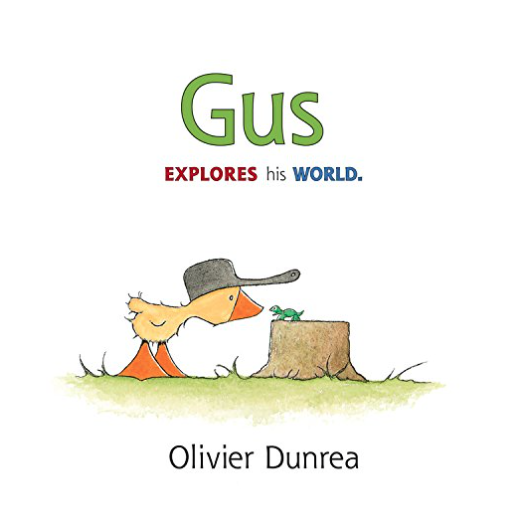 Along with these two brand new books being added to the Gossie & Friends series Gottmer has also published Ollie’s Halloween and Merry Christmas, Ollie! 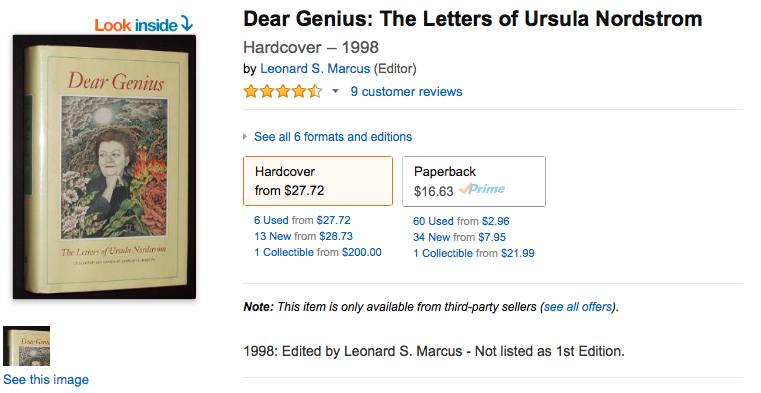 I had no idea they were working on acquiring the rights to these two books! I’m thrilled! When I was in Belgium last year I took the train up to the Netherlands to meet with the folks at Gottmer in Haarlem. It was a wonderful meeting and I really like these people! We had discussed the possibility of the holiday books being translated into Dutch, but I wasn’t certain it was going to happen. The other two books are original creations by Gottmer. They have combined two separate books/stories into one book! These editions look great! Gottmer does quite a bit with the goslings and I am pleased with all that they do. 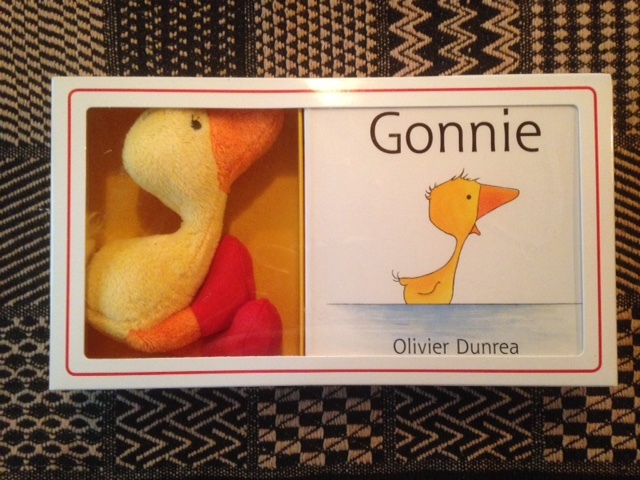 They even produced a stuffed Gossie toy and book combo that you can only purchase in the Netherlands. It’s been an exciting day here in the studio!